My research covers a wide range of species and utilizes a multitude of, mainly molecular, approaches. I'm particularly interested in how environmental and organism-specific factors drive population differentiation, diversification, speciation and hybridization. My research mainly focuses on the adaptive radiation of cichlid fishes of Lake Tanganyika. The Great East African Lakes (Tanganyika, Malawi, Victoria) are known for their cichlid species flocks containing hundreds of species and thus provide ideal model systems for studying adaptive radiation. Lake Tanganyika is the oldest of these lakes and harbors the ecologically, morphologically, and behaviorally most diverse assemblage of cichlids. At present about 200 cichlid species are described from Lake Tanganyika, but there are several more awaiting scientific description. The present day cichlid species flock of Lake Tanganyika consists of both ancient African lineages that now exist nowhere else and modern lineages that arose during the Tanganyikan radiation itself. High speciation rates in East African cichlid fishes are believed to be driven by the complex interaction of extrinsic factors, such as major biogeographical processes and intrinsic biological characteristics of the involved organisms. Thus, assessing the relative importance of extrinsic factors (providing the opportunity for radiation) and intrinsic factors (giving the potential to radiate) is an important prerequisite to understand the process of adaptive radiation. Several major cladogenesis events in Lake Tanganyika cichlids can be correlated with severe habitat changes in the form of lake level fluctuations. Interestingly this is true not only for rock-dwelling cichlids, but also for species living in open water. By means of molecular genetic approaches questions concerning phylogeny, phylogeography, population genetics and mating system of Lake Tanganyika cichlids are addressed. I am also working on the phylogeography of riverine cichlids, mainly from Zambian rivers, to compare their modes and degrees of diversification with those of lacustrine cichlids. I am also working on evolutionary and conservation genetics of North American canid species. In particular I'm focusing on the hybridization dynamics between coyotes and wolves, with a special focus on the Great Lakes area. Like elsewhere in the US, the wolves of the Great Lakes region were almost exterminated at the beginning of the last century due to habitat depletion associated with the spread of agriculture and direct persecution, while the coyote drastically expanded its distribution range, invading areas previously occupied by wolves. The habitat continues to change, as many farms are abandoned and the forests are now expanding. Under the protection of the US Endangered Species Act, the Great Lakes wolves have recovered to currently >3000 individuals in the newly available forested habitat. Nonetheless, it is very unlikely that coyotes will cease to be part of this ecosytem in the forseeable future, thus, coyote and wolves coexist in close proximity. The recovery of the Great Lakes wolves resulted in an extensive debate regarding their potential delisting. However, at present there is still no consensus about which species of wolf-like canid currently inhabits the Great lake region and if the integrity of this population is under threat by hybridization with coyotes. Molecular genetic approaches are used to clarify the taxonomic status of the wolf-like canids in the Great Lakes region and to study the hybridization patterns between these species. Moreover I'm looking at large scale phylogeographic patterns in both wolves and coyotes with a particular interest in the colonization of North America by gray wolves. The very different climatic and hydrologic environments in Austria are mirrored by a large variety of habitats and, as a result, also biodiversity. Many Austrian animal species are threatened with extinction and a large number is a least partially imperiled. Quite a few species are endemic to Austria. Suprisingly littele is known about the (genetic) diversity of the Austrian fauna. DNA barcoding, the standardized genetic analysis of a given, species-specific part of the genome, can give a first but important hints at the genetic diversity and aids in developing new efficient methods to assess biodiversity or track invasive or endangered species. 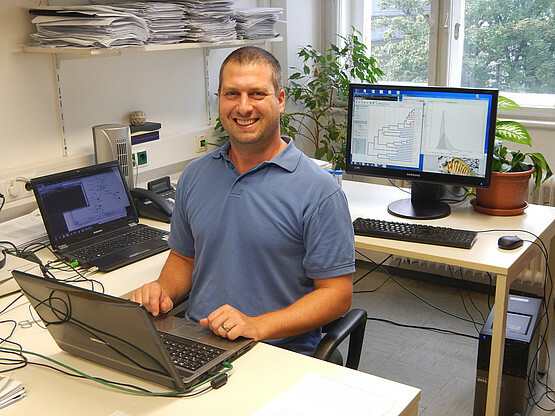 By means of a geographically and taxonomically comprehensive barcoding approach, new research project can be instigated which in turn will yield new knowledge about and a deeper understanding of Austrian biodiversity.